Only when I was living in Krakow about ten years ago and saw a production of Beckett’s “I’ll Go On” in London did I suddenly see Ireland and Poland as doubles—small countries with beleaguered pasts, a history of failed uprisings, proclivities for Catholicism and drink, and a preternatural talent for dark absurdist humor, gift of the gab, and, whether despite or because of all the aforementioned, damn great literature. But as much as I’ve grown to respect Polish literature, I hesitated before embarking on Wiesław Myśliwski’s Stone Upon Stone, a 500-plus-page commitment of a novel described as “peasant literature.” It’s not that I didn’t trust the novel insomuch as I didn’t trust myself, a self-described city girl whose closest positive encounter with nature was admiring “The Gleaners,” François Millet’s 1857 painting of three peasant women gathering grain after the harvest, housed at the Musée D’Orsay. Szymek, the least likely of four brothers to take over the family farm, constantly causes mischief as a child, to the point that his superstitious and God-fearing father almost hangs the young boy in a fit of rage for having eaten a hidden piece of stale Christmas bread meant to bless the spring soil. Recollections of his family and coming of age, the dances and skirmishes of village life, his turns as a barber, policeman, wedding official, and government worker, are all interwoven with stories of his near death experiences as a resistance fighter during the war. And what if along with the people the dogs and cats went quiet, and all the other animals, and the birds stopped chirping and the frogs stopped croaking. Would there be a world? Even trees talk if you actually listen to them. Each kind has its own language, the oaks speak oak, the beech trees speak beech. Rivers talk, corn. The whole world is one big language. If you really listened carefully to it, you might even be able to hear what they were saying a century back, maybe even thousands of years ago. Because words don’t know death. They’re like see through birds, once they’ve spoken they circle over us forever, it’s just that we don’t hear them. Dualisms are woven throughout this work of life as memory—life and death, earth and sky, land and God, godlessness and faith—pulling our consciousness forward, picking up various threads or tracks when the narrative shifts course, the way minds tend to do. This representation of consciousness and speech is reminiscent of Beckett, though Myśliwski convincingly demonstrates a greater faith in nature and tradition, language and the possibility of human connection. The fact that the novel makes you feel as if you’re in the actual presence of Szymek, who’s verbally recounting his life story to you, testifies to the talents of Myśliwski as well as to the translator of this masterwork, Bill Johnston. Szymek’s own “gift of the gab” serves others throughout the novel in almost priest-like fashion. People would set their work aside to come hear his speeches during his three years as a wedding official, when even the open window would be “lined with people listening outside, like flowerpots.” In recollecting one speech that brought almost everyone to tears, containing a fable about a king unable to dream— “It was like he was only half living, he lived in the day but he died at night. Imagine dying like that for years and years, when even dying once is so hard”—he confesses, “Where I got it all from I have no idea.” And, later, while in the hospital, his narrative skill gives comfort to his dying neighbor. Szymek leads him with words, “the way you take a child’s hand to lead him across a footbridge over the river,” to a pastoral image of “lying on hay, in the meadow, by the river, in the shade of a tree,” to just “melt away in that noise, among the springs and the bees and the clouds and […] be carried away by the tired, tired earth.” Stone Upon Stone is a hymn to life, and also an elegy. 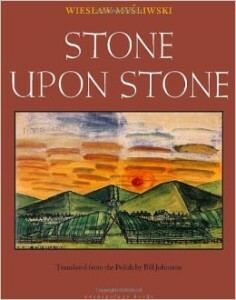 Stephanie Steiker‘s review of Stone Upon Stone originally appeared in TLR’s Spring 2011 issue, Emo, Meet Hole.